From Florida to Texas, five southern U.S. states are involved in building and launching the Space Launch System, NASA’s new heavy lift rocket. 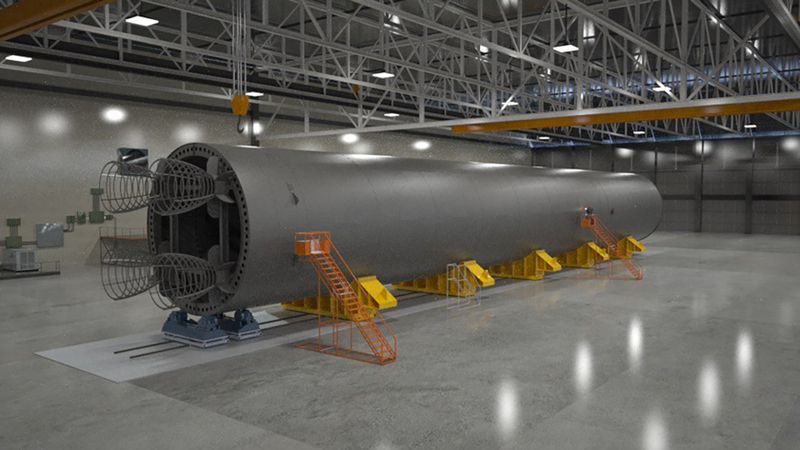 After the first SLS core stage rolls off the assembly line next year at the Michoud Assembly Facility in New Orleans, Louisiana, engineers will haul the rocket by barge up to Stennis Space Center in Mississippi for engine testing. It will eventually be sent around the Florida peninsula to Kennedy Space Center, where it will be joined to its upper stage, solid rocket boosters, and finally, the Orion spacecraft. This is not a simple process. SLS is 8.4 meters wide, 65 meters long, and weighs in at 85 metric tons without fuel. Before NASA starts moving around flight hardware, they’ll practice with a steel stand-in (the real core stage is made out of aluminum alloy) called the core stage pathfinder. The pathfinder will be ready for action early next year. The SLS core stage pathfinder is a 65-meter-long, full-size mockup of the actual rocket's main section. The pathfinder is a microcosm of SLS itself—and not just because it’s a physical stand-in. There are multiple contractors and subcontractors associated with NASA’s Marshall Space Flight Center in Huntsville, Alabama. Pieces of the pathfinder ship to a central location for assembly. And the pathfinder will visit three NASA centers in the southern U.S. I mapped out the journey of the core stage pathfinder using StoryMap, a free tool from Northwestern University’s Knight Lab (thanks to the Houston Chronicle's Adrift series by Eric Berger for the idea). Click through and you’ll see just how complex this one, seemingly minor aspect of the SLS program is. It’s helpful when visualizing how individual NASA projects impact local economies, and why politicians are eager to keep these programs in their districts. The pathfinder project costs about $8.6 million, according to NASA representatives. It’s part of a larger, five-year engineering contract awarded by Marshall to three companies back in 2013, worth a potential $350 million.